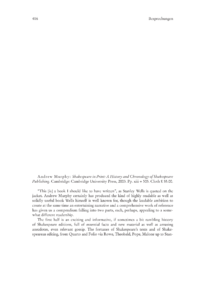 Andrew Murphy: Shakespeare in Print: A History and Chronology of Shakespeare Publishing. This [is] a book I should like to have written, as Stanley Wells is quoted on the jacket. Andrew Murphy certainly has produced the kind of highly readable as well as solidly useful book Wells himself is well known for, though the laudable ambition to create at the same time an entertaining narrative and a comprehensive work of reference has given us a compendium falling into two parts, each, perhaps, appealing to a somewhat different readership. The first half is an exciting and informative, if sometimes a bit rambling history of Shakespeare editions, full of essential facts and new material as well as amusing anecdotes, even relevant gossip.